The VAWT (vertical axis wind turbine) also called Darrieus-Rotor is a wind turbine with a vertical axis. 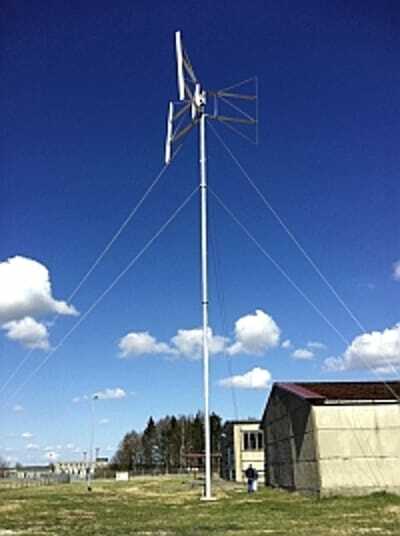 This wind turbine (VAWT) has been developed and patented by Georges Darrieus in the USA in 1931. The rotor blades of the classical design are curved outwards and the upper and lower tips of the curves are tapered toward the axis. Compare to the traditional curved blades design our rotor has two or three vertically upright, parallel blades fixed on horizontal arm hat provides a larger wind swept surface and therefore a higher yield. Standard products covers the needs between 5 kW till 22 kW and can be combined with other Off-Grid solutions like CHP or Photovoltaic.